Jesse Barrett is a Northern California native and has played oboe and English horn with numerous Northern and Central California-area ensembles, including including the Sacramento, Fresno, and Reno Philharmonics, Santa Cruz, Monterey, and Stockton Symphonies, Reno Chamber Orchestra, San Francisco Academy Orchestra, Berkeley Community Chorus and Orchestra, Bear Valley Music Festival, Music in the Mountains, Mendocino Music Festival, and St. John’s Chamber Orchestra Festival. 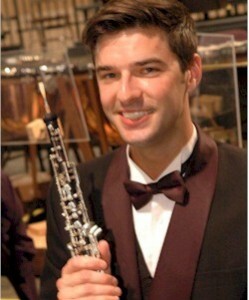 Most recently, he has occupied the principal oboe chair for the Merced Symphony and Townsend Opera Players (in Modesto). An avid chamber musician, new music enthusiast and teacher, he often finds himself involved in starting up new ensembles, teaching at music camps, making school visits, and collaborating on solo and chamber concerts all over the Northern California area. Mr. Barrett earned his undergraduate degree from the University of the Pacific where he was a member of Phi Mu Alpha Sinfonia, and thereafter obtained a Master of Music degree from Boston University where he was inducted as a member of Pi Kappa Lambda.